Last night's manicure showed you one of the Sation Nailstock colors, but it definitely didn't glorify it. I had to give RV There Yet? another try tonight, with some complementary colors and accents to really help it pop. Isn't it gorgeous? That almost antique jade color works perfectly with the ill pink color of Decades of Dysfunction (ORLY) and the gold striping tape. I love the way the colors and the design makes my fingers look. Elegant but definitely not ordinary. Have I convinced you to get your Nailstock collection yet? I think I have, but for those who aren't sure, check out the Nailstock supply at the Miss Professional Nail store for all the colors you're missing out on. 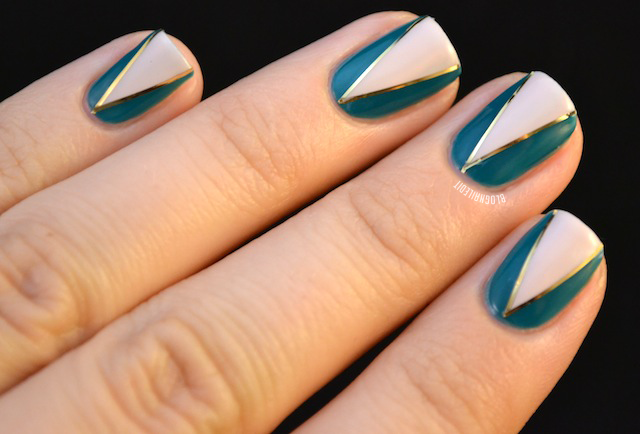 I've also added this manicure to a contest hosted by Birchbox. If you have a moment, I'd love your vote! Click here to be taken to the entry on Facebook. This is hot! so chic! :D It's like you're wearing jewelry on your nails! I am loving this! I think I am going to try and recreate it for the 31 day challenge I am doing, hope thats ok.
Oooooh! Love it! 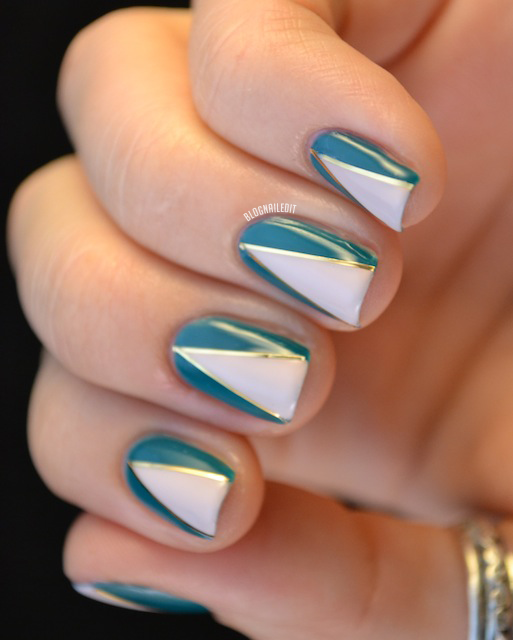 One of the best manis I have seen lately! Love the classic, elegant yet edgy look! Love this one!Makes me think of art deco. I strangely also have a penchant for triangles. The design looks almost 3D - it's fab! This is so totally beautiful! Very elegantly art deco, and the colours really do pop. I love it! This is gorgeous! How long did the striping tape last though?